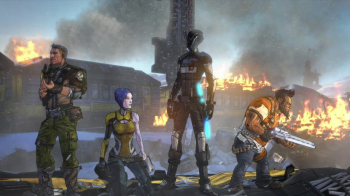 The CEO of Gearbox hints that new characters and vehicles are in the pipeline. Now that Borderlands 2 is out the gate and everyone is busy raining hot brass all over Pandora, Gearbox Software is focusing its attention on the upcoming DLC packs. This includes the new Mechromancer character class and four additional DLC expansions that will be covered in the Season Pass. It appears, however, that the company is already thinking about supporting the game with even more paid content that lies outside the scope of the pre-paid DLC bundle. Randy Pitchford, CEO of Gearbox Software, revealed the news in an open Q&A session, where he spoke of expansions beyond that of the Mechromancer add-on. "Things like new weapons and enemies will come in campaign DLCs and other DLCs," he explained. "We will have other, non-season pass related DLC. The additional (Mechromancer) character is one kind of example." "Since we finished the game, we've started with some new ideas that we expect will show up in DLC. Some new vehicle types are on-deck - awesome stuff." The Mechromancer DLC is set for release on October 16th, although Pitchford had no announcements regarding the upcoming Season Pass DLC, other than mentioning that the first installment is "extremely far along" and the second is "also in amazing shape". He says that the Campaign-style DLC contained in the Season Pass will be considerably rich in content, similar to previous Borderlands DLC packs such as The Secret Armory of General Knoxx.